From one spot at Zion Mountain Ranch Resort, it is possible to view sections of three of America's greatest national parks. Look east and you can easily see the southern end of Bryce Canyon National Park, rising 9,000 feet above sea level. Turn south and you'll see the Kaibab Plateau, which is home to the north rim of the Grand Canyon. Then turn to the west and you'll be gazing into the majestic sandstone formations of Zion National Park, just two miles away from where you're standing. "We don't know of any place in the world where you can stand in one spot and see portions of three national parks," says Kevin McLaws, the founder of the resort. Spanning 5,000 acres, the resort style ranch features exquisite lodges, a restaurant, two gift shops, a Native American Cultural Center and a roaming herd of buffalo. A split rail fence holds the buffalo in a 400-acre meadow and brings an Old West atmosphere to a setting that looks something like the rolling hills of the Midwest. Located at the east gate of Zion National Park, guests of Zion Mountain are able to unpack once and experience seven national parks and monuments all within a two-hour drive. The ranch is surrounded on three sides by federally protected land and is covered by high mountain meadows and forests. The lodges are appointed with many of the finer amenities you'd expect, including a shower, microwave, coffeemaker, fireplace, television, porch swing, and many even have jetted tubs. Horseback riding trails ascend white sandstone cliffs to the upper levels of the ranch, giving riders an excellent view into Zion Canyon. Guided rides are available and you'll enjoy the interpretive information provided by your guide. Photography opportunities are plentiful as the resort is flush with wildlife, including deer, wild turkeys and other animals that naturally migrate through the ranch. The ranch offers an extensive list of outdoor activities, including canyoneering, mountain biking, hiking and rock climbing and after all that outdoor recreation, in-room massage. "Jeremy was a terrific guide," says guest Mary Jackson. "He was professional, personable, knowledgeable, fun, and made everything safe while allowing us to still be challenged. We knew we could count on him to "save the day!" The canyon was beautiful. For us, it was quite an adventure; we had a great time." 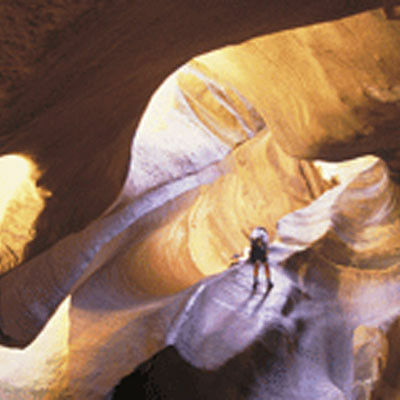 Canyoneering is a rapidly emerging sport that brings adventure seekers into the nooks and crannies of the rocky landscapes and slot canyons. 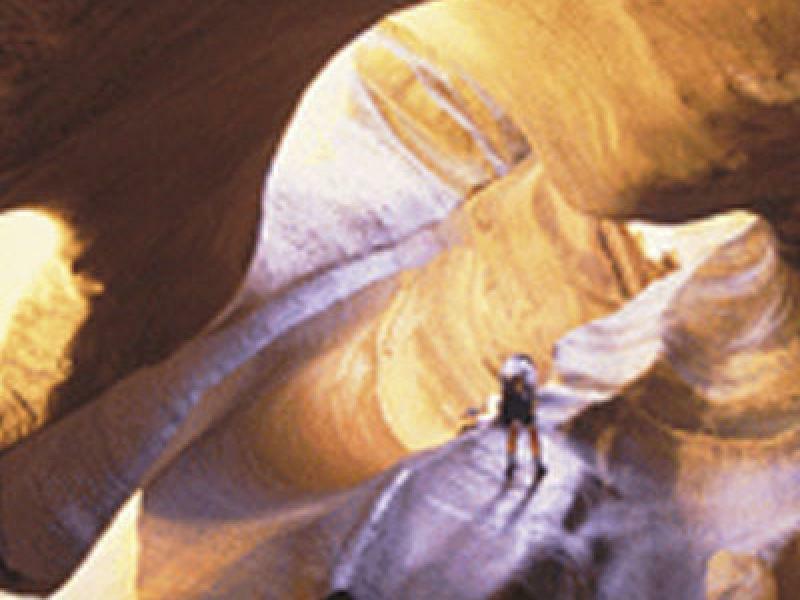 Climbing, rappelling, and hiking are all a part of canyoneering, and participants of all ages can take advantage of the beautiful, narrow slots scattered throughout the surrounding area. Adventure guides provide all of the necessary equipment and training for day excursions. At the ranch's Native American Cultural Center visitors may take a walking tour, make Native American crafts, learn how to shoot a bow and arrow and throw a tomahawk. Performances of native dances and stories are part of the evening experience at the Village of Many Nations. "It was great to get up on stage and actually experience a Native American dance," says vacationer Wendi Epps. "We had a really great time." Zion Mountain Ranch has big plans for the future. In addition to a new lodge, plans include a golf course, equestrian center, and hot springs-style pool facility. The golf course will be hidden on a plateau where it will be invisible to most visitors. Scenic Highway 9 that comes through Zion National Park divides most of the 5,000-acre ranch. Existing power lines along the highway will be put underground to take the whole environment back to 100 years ago. In fact, it was approximately a century ago that a young man brought his bride to the area and promised to build her a fine log cabin if she would stay with him on Zion Mountain. That cabin still stands today right next to the meadows where the buffalo now roam. Zion Mountain Ranch Resort offers the closest lodging to the east gate of Zion National Park, and the proximity to other national parks and monuments is incomparable.